We recommend checking out our discussion threads on the Studio Network Solutions EVO 8TB (4 x 2TB) 16-Bay 16EXP4X2TB-14A, which address similar problems with connecting and setting up Network Attached Storage Drives Studio Network Solutions. The user manual for the Studio Network Solutions EVO 8TB (4 x 2TB) 16-Bay 16EXP4X2TB-14A provides necessary instructions for the proper use of the product Computers & Solutions - Networking - Network Attached Storage Drives. The EVO 8TB (4 x 2TB) 16-Bay Expansion Chassis from Studio Network Solutions is compatible with the 8 and 16-bay EVO Shared Media Storage Server. This expansion chassis connects directly to each storage server and does not rely on a Fibre Channel or Ethernet connection. The 8-bay EVO is able to support one expansion chassis for a total of up to 24 drives, while the 16-bay EVO is able to support up to four expansion chassis, for a total of up to 80 drives. 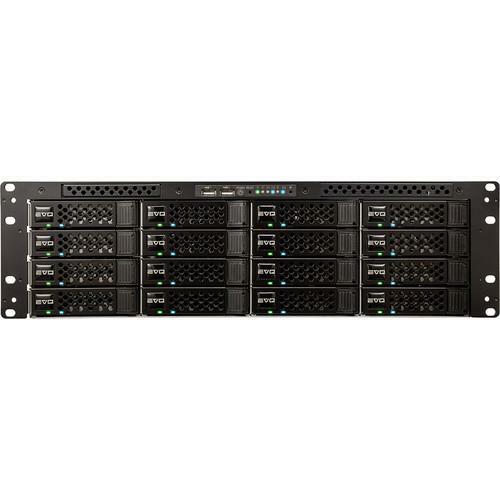 This expansion chassis includes 4 x 2TB drives for an initial capacity of 8TB. However, this only uses four of the system's 16 SATA III 6 Gb/s bays, leaving 12 open for additional drives to be installed. This chassis also has a height requirement of 3U and operates using 100-240 VAC at 47-63 Hz. It is powered by an 860W redundant power supply that is comprised of dual 860W modules with a maximum load of 13-6.5A. The user manual for the Studio Network Solutions EVO 8TB (4 x 2TB) 16-Bay 16EXP4X2TB-14A can be downloaded in .pdf format if it did not come with your new network attached storage drives, although the seller is required to supply one. It is also quite common that customers throw out the user manual with the box, or put the CD away somewhere and then can’t find it. That’s why we and other Studio Network Solutions users keep a unique electronic library for Studio Network Solutions network attached storage drivess, where you can use our link to download the user manual for the Studio Network Solutions EVO 8TB (4 x 2TB) 16-Bay 16EXP4X2TB-14A. The user manual lists all of the functions of the Studio Network Solutions EVO 8TB (4 x 2TB) 16-Bay 16EXP4X2TB-14A, all the basic and advanced features and tells you how to use the network attached storage drives. The manual also provides troubleshooting for common problems. Even greater detail is provided by the service manual, which is not typically shipped with the product, but which can often be downloaded from Studio Network Solutions service. If you want to help expand our database, you can upload a link to this website to download a user manual or service manual, ideally in .pdf format. These pages are created by you – users of the Studio Network Solutions EVO 8TB (4 x 2TB) 16-Bay 16EXP4X2TB-14A. User manuals are also available on the Studio Network Solutions website under Computers & Solutions - Networking - Network Attached Storage Drives.